Corner brackets help prevent rocking and improve stability and rigidity. 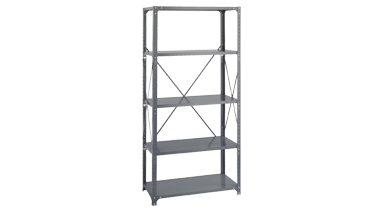 Hat channels under every shelf help prevent bowing and deflection due to overloading. Greenguard certified. 36"W x 18"D x 75"H. Dark Grey. Ready to assemble. Shelf capacity of 750 lbs.